GoldETFs.biz has released an overview on all inverse gold ETF and ETN products in the U.S. marketplace. Our short gold ETF overview conveniently delivers insight on this unique product set. Leading gold ETF website, GoldETFs.biz, has released an investor centric overview on all short gold ETF and ETN products available in the United States. These products, commonly referred to as inverse gold ETF and ETNs, are designed to deliver the inverse return of the price of gold, or in some cases, a basket of gold mining stocks. Thus the ETFs and ETNs profit when gold declines. The inverse gold ETF overview is designed to identify inverse gold products, define the unique investment objective of each product and offer several questions to ask before considering an inverse gold ETF. "The goal of our short gold ETF overview is to conveniently deliver important information to investors about this unique product set," said Christian Magoon publisher of GoldETFs.biz. "ETFs that profit from the decline in the price of gold or gold stocks are less intuitive than traditional ETFs. They require an extra level of education. Our overview begins that process for investors." There are over 20 gold ETFs and ETNs in the U.S. marketplace currently, five of them are inverse gold products. Together these inverse products hold over $1.5 billion of investor assets. Leading inverse gold providers include companies like Invesco PowerShares, Direxion and ProShares. GoldETFs.biz was designed to be a focused, convenient, educational and social source of gold ETF and ETN information for investors. The site provides a complete gold ETF list and data, consistent analysis and real time market opinions through focused Twitter feeds. 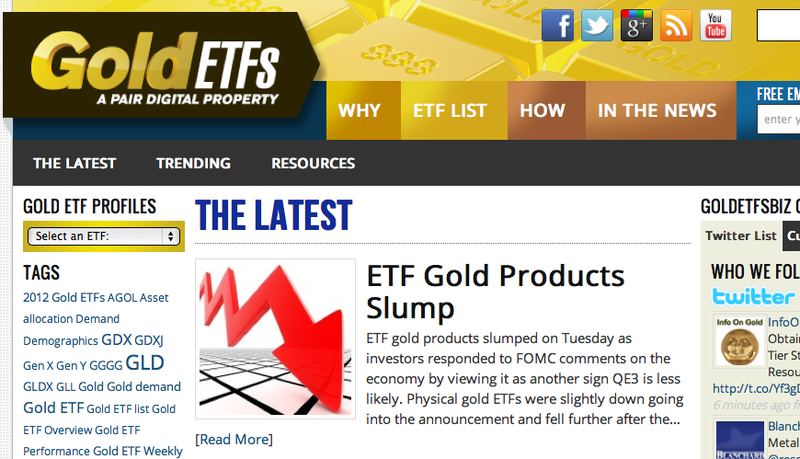 Visitors to the sites can subscribe to the free weekly Gold ETF Report.